I have a question about the numbers used in the Campaign Resources part of The Practical Enchanter. While the conclusion I entirely agree with on a broad level “stuff is around to a degree that genuine novel ideas would be somewhat rare” the specifics for your number of wizards and Adepts elude me. Hamlets have a -2 community modifier, Wizards are 1d4, Adepts are 1d6. So unless I am missing something Wizards have a 50/50 chance of not being present, if they are you either have a single 1st level, or a 2nd level with two 1st level, based on rolls of 1 & 2 just being below 0, 3 being a single 1st, 4 being a 2nd which then generates two 1st. Were they more common in your world, thus using a larger die, or am I missing something with the community modifier? Basically it’s because the first draft was done from notes while I was away from the books – and I intended to add the community modifiers later. Then, for good or ill, I forgot to put them in, and the draft section got put into The Practical Enchanter without including the community modifiers. Given that only a few people seem to have noticed, that it doesn’t really change the general outcome of the calculation particularly, and that including those modifiers gets VERY messy and takes up far too much room (and is dull to boot), I’ve never considered it a particularly urgent problem to fix. In a way, the error was a good thing. Applying the community modifiers gets more than a little weird. To see why, the first thing to do is to look at the population distribution. Lets say we have 10,000,000 people in the kingdom. What can we expect in the way of communities? 70% dwell in Thorps (Often no more than a couple of farmhouses, a wandering tribe of hunter-gatherers, or a group of woodcutters and their families) averaging 50 people – 119,000 Thorps (one roll each at -3, special modifiers for Rangers/Druids). 20% dwell in Hamlets averaging 240 people – 8,854 Hamlets (one roll each at -2, special modifiers for Rangers/Druids). 10% dwell in Villages averaging 650 people – 1385 Villages (one roll each at -1). 30% dwell in Small Towns averaging 1450 people – 310 Small Towns (one roll each at +/-0). 20% dwell in Large Towns averaging 3500 people – 86 Large Towns (one roll each at +3). 20% dwell in Small Cities averaging 8500 people – 35 Small Cities (two rolls each at +6). 15% dwell in Large Cities averaging 18,500 people – 12 Large Cities (three rolls each at +9). 15% dwell in Metropolisis averaging (perhaps) 40,000 people – 6 Metropolisis (four rolls each a +12). Personally, I’d call it three plus a Capital with 120,000 or so people. Is this debatable? Well… few sources agree – but De Vries estimates for Europe (1500) gives a total of about sixty million people and 154 locations with 10,000 or more inhabitants. Given that about a third of the “Small Cities” will run 10,000+, this model gives 166 such locations. That’s not too bad of a match for some pretty crude estimates from a rule of thumb of “80 to 90% or more in tiny rural settlements”. So we have… 447 Urban Communities and 129,239 Rural Communities. Out of a total of 129,686 communities, 99.7% are rural, and 91.8% are Thorps. Thorps may have only one roll, and that at a penalty – but they’re going to dominate the statistics since they get 90% of all the rolls. Ergo, lets start with Thorps. First up; Clerics. After all, every tiny cluster of people needs a priest! At (1d6-3) we get an average distribution of three 50-inhabitant thorps with no cleric, one with a first level Cleric, one with a second level Cleric and two first level Clerics, and one with a third level Cleric and two first level Clerics – 5 L1, 1 L2, and 1 L3 Clerics, or 7 Clerics per 300 people – 2.33% of the population. Straightforward enough. The same goes for Adepts and Bards (I won’t even bring up the base classes that were added later… the community generation rules were never really revised to include them). Oh yeah! There’s no stopping us now! That’s an extra 48 L1, 16 L2, 8 L3, 4 L4, 4 L5, 4 L6, 1 L8, 1 L9, 1 L10, 1 L11, 1 L12, and 1 L13 Druids. So our expected Druid percentage is ((114/6) x the Base + 90 extra druids) = 223 Druids per 6000 people = 3.7% of the population. Out of every ten million, you’ll get about six million people living in Thorps. Your kingdom thus starts off with 143,000 L1, 35,000 L2, 27,000 L3, 4000 L4, 4000 L5, 4000 L6, no L7 (they must all be on sabbatical in another dimension), and 1000 each of levels 8 through 13 druids for a total of 223,000 druids in total – but not a single Cleric of above level three as of yet and only 140,000 (100,000 L1, 20,000 L2, and 20,000 L4) of them in total. That provides a total of 48 L1, 24 L2, 8 L4, 4 L5, 2 L8, 2 L9, and 2 L10 rangers per 6000 people in Thorps – 1.5% of the population. Still, that gives us 90,000 rangers in the kingdom’s Thorps, including 2000 each of levels eight, nine, and ten. That gives us a total of 12x L1, 5x L2, 1x L3, 1x L4, and 1x L5 per 400 people – 5% of the population, or 300,000 out of our six million, including 75,000 at level two and 15,000 each at levels three, four, and five. That sounds better. Given that this is d20, and monsters abound I don’t see any reason why Monks and Barbarians shouldn’t be “more common” EVERYWHERE – but I’ll stick with the basic calculation for the moment. Fighters and Rogues use a d8 base, so that’s also the number for them. Sorcerers and Wizards use a d4 base. They’ll appear in the same ratio that base-die Barbarians do. But wait! What about Warriors (2d4), Experts (3d4), and Commoners (4d4)? Here the math gets… even messier. So out of every 16 Thorps you can expect 1 L5 (2 L2), 2 L4 (4 L2), 3 L3, 4 L2, and 3 L1 Warriors – 19 per 16 Thorps, or 141,312 in total. So out of every 64 Thorps we have 1 L9 (2 L4, 4 L2), 3 L8 (6 L4, 6 L2), 6 L7 (12 L3), 10 L6 (20 L3), 12 L5 (24 L2), 12 L4 (24 L2), 10 L3, 6 L2, and 3 L1 Experts. That’s a total of 1 L9, 3 L8, 6 L7, 10 L6, 12 L5, 32 L4, 42 L3, 79 L2, and 3 L1 Experts (188 total). You can multiply by (119,000/64 or 1859 if you want totals for the kingdom. So out of every 256 Thorps, we can expect to roll up 1L 13 (2L 6, 4L 3), 4L 12 (8L6, 8L 3), 10L 11 (20L 5, 40L 2), 20L 10 (40L 5, 40L 2), 31L 9 (62L 4, 124L 2), 40L 8 (80L 4, 320L 2), 44L 7 (88L 3, 176 L 2), 40 L6 (80 L3), 31L 5 (62L 2), 20L 4 (40 L2), 10L 3, 4L 2, and 1L 1 Commoners. That’s 1L 13, 4 L12, 10 L11, 20 L10, 31 L9, 40 L8, 44 L7, 50 L6, 91 L5, 162 L4, 190 L3, 806 L2, and 1 L1 (1450 leveled) commoners per 256 Hamlets (multiply by 465 if you care about the numbers). At 119,000 Hamlets, that’s 674,023 leveled commoners out of our six million people in Thorps. Now, we’re supposed to divvy up the remaining population as 91% Commoners, 5% Warriors, 3% Experts, .05% Aristocrats, and .05% Adepts. Well, I’ll have to figure out how many people remain to account for first. Adepts, 100,000 L1, 20,000 L2, and 20,000 L3. Warriors, 141,000 (of various levels up to 5). That comes to 2,648,000 out of our 6,000,000 – leaving us with 3,352,000 to split up. That gives us another 167,000 first level warriors, 100,560 first level Experts, 16,760 first level Adepts, 16,760 first level Aristocrats and 3,050,320 first level commoners – not that this matters all that much in most games. Things are getting a little weird here though… Disregarding Commoners and Experts, the high-level end of things is totally dominated by Druids, followed by Rangers – and every other class only has a few mid-level types. Maybe moving on will fix things? Hamlets have only a -2 community modifier instead of a -3, although they have the same boosts for Druids and Rangers (which tells us where the level seven Druids are; they live in town for some reason). First level Paladins, and second level Sorcerers and wizards will start to appear – but the overall numbers are going to look quite a lot like those for a Thorp. The big impact will be on Paladins and Rangers – the two classes that use a 1d3 base. Those 8854 rolls will add in nearly three thousand first level Paladins and Rangers, which is a big deal for the Paladins when the original number of Paladins was “none”. Next up will be the d4 classes – Aristocrats, Barbarians, Monks, Sorcerers, and Wizards, who will get 1 L2 and 3 L1 members out of every four hamlets – adding another 2213 L2 characters and 6640 L1 characters. Other than that… the ratios will remain much the same. That helps some of our scarce classes – but not a lot. Paladins are still vanishingly rare, which is, perhaps, as it should be. Villages have only a -1 community modifier, but no longer get extra Druids and Rangers. Still, with only 1385 villages… they’re not going to have a big impact on the numbers. Thorps dominate our calculations because there are just so many of them – and because the percentages of above-level-one classed characters in them are very high in comparison to those in larger settlements. Towns and above have better community modifiers – but their overall contribution to the statistics is almost negligible as far as raw numbers go. They WILL contribute a small number of very high-level types, but they will not even approach the number of druids that Thorps contribute. Worse, the best modifier – for a Metropolis of 25,001 or more people – is only +12. A Small Town (Community Modifier +0) rolls once and there are 310 of them. A Large Town (Community Modifier +3) rolls once and there are 86 of them. A Small City (Community Modifier +6) rolls twice times – but there are only 35 of them. A Large City (Community Modifier +9) rolls three times – but there are only 12 of them. A Metropolis (Community Modifier +12) rolls four times – but there are only 4 of them. A Large City will, on the average, have 3/4’th 10’th, 3/4th 11’th, 3/4’th 12’th, and 3/4’th 13’th level Wizards and their associated lesser characters – as well as 1/2 each Clerics and Druids from levels 10-15. There are 12 of them, so 9 13’th level Wizards. An average Metropolis will have one 16’th, one 15’th, one 14’th, and one 13’th level Wizard. 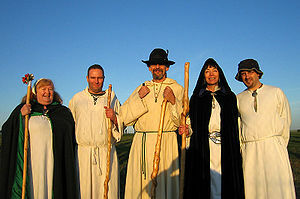 It will also have 2/3’rds each of 18’th, 17’th, 16’th, 15’th, 14’th, and 13’th level Clerics and Druids. There are four of them, so four Wizards of each of those levels (along with their subsidiary Wizards – (2x L8, 4x L4, 8x L2, 16x L1 per L16 guy), (2x L7, 4x L3, 8x L1 per L15 guy), (2x L7, 4x L3, 8x L1 per L14 guy), and (2x L6, 4x L3, 8x L1 per L13 guy) for a total of 4x L16, 4x L15, 4x L14, 4x L13, 8x L8, 8x L7, 8x L6, 8x L4, 24x L3, 16x L2, and 160x L1 = 308 wizards in the Metropolises). So our average kingdom of ten million has… thirteen 13’th level wizards and four each of levels 14, 15, and 16. It also has nearly 1100 13’th level druids and at least eighty 14’th level types – with competitive numbers in the 15 and 16 range and clearly superior (to “none”) numbers in the 17-18 range. That doesn’t sound much like a normal d20 world of course, but so be it! And now you know another reason why I’ve never bothered to correct the original mixup. It’s because I have trouble coming up with a justification for why Druids dominate the world to that extent or a reason why they don’t when there are so MANY of them. The “correct” numbers are just too far out of whack to do much with except ignore them – while the ones with the mistake included actually do make some sort of sense (which is probably why I forgot to fix it in the first place). The community generation system doesn’t make much sense to begin with. After all, for example, if Sorcerers are born, not trained, shouldn’t they be a fairly well fixed percentage of the population? Shouldn’t Wizards make up a larger percentage of the population in cities where there are more chances to study than they do in rural areas instead of the other way around? Yet the rules say that there is one Wizard per 200 people in Thorps, but a mere 1 per 526 in the Metropolises. It was that sort of question which prompted me to put the “Town Resources” section into The Practical Enchanter – redefining how communities worked to try to make it make a little more sense. That’s also one reason why the Feats chapter quietly insinuates that rural arcanists are fairly common, even if they do mostly rely on the Hedge Magic feat.